Winner of six club “Awards Night” trophies. Daughter of Karen Jones, Beth joined the club as soon as she was 10, to follow in the footsteps of big brother Ashley and big sister Karis. She was noted as being enthusiastic and supportive of any team effort. 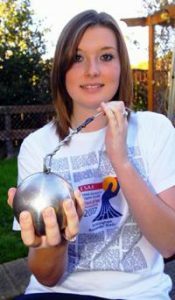 In 2005 she really did start to follow in Ashleys footsteps as she began to concentrate on throwing events especially Hammer and Javelin. In 2006 Beth came 5th at the AAA U15 Championships. In 2007 as a first year U17, she was selected to represent Avon at the English Schools Championships finishing in 8th position. In 2008 Beth broke through the 40m barrier and again gained Avon Schools selection and competed at Gateshead in the English Schools Championships, this time finishing in 5th position. In the same season she also represented the South West in the UK Schools Games at Bath, finishing sixth. In 2009 Beth moved up an age category (U20/Senior Girl) and finished 13th at the English Schools Championships in Sheffield. The last two years of her athletic career, Beth was a real team player and consistently turned out for the club at the Senior Midland League, scoring very useful points in the Hammer, Discus, Shot and Javelin.